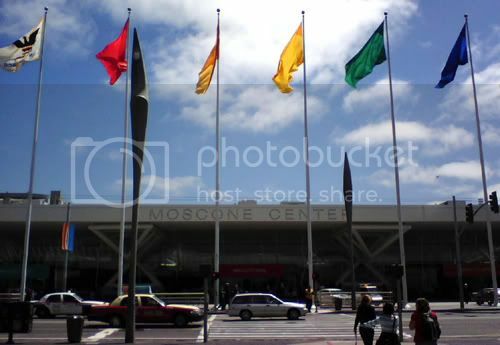 View of the Moscone Center where VMWorld 2009 was held. According to widespread reports, most recently an anonymously sourced report in the Wall Street Journal, Cisco and EMC Corp. are brewing up a joint venture to more easily bundle up EMC storage with Cisco’s UCS. 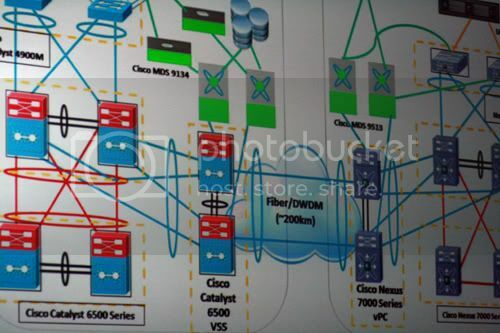 Judging by the amount of buzz, there probably is something happening; EMC storage was also exhibited as part of Cisco’s gigantic UCS demo at the show. According to one of my sources, who also requested anonymity, a joint venture would be a way for the companies to jointly market UCS with EMC storage without doubling up on the commission paid to separate sales forces. If this deal happens, I think it would probably put the kibosh on the longstanding Cisco/EMC merger rumors, which date back at least as long as I’ve been in the storage market. Should they spin off a joint venture, I think it would be an indication that both organizations have gotten too large and complex to fully merge. 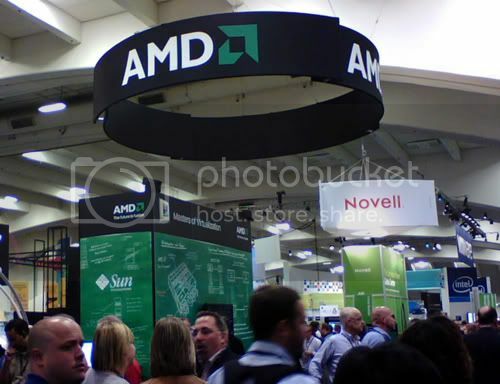 It would also be part of a general trend of alignment between companies whose products live at the top of the data center stack – apps, networking, and servers – and middleware/networking/storage counterparts, whether through acquisition a la Sun/Oracle or partnership as with Dell/Brocade. Cisco and EMC have declined comment. 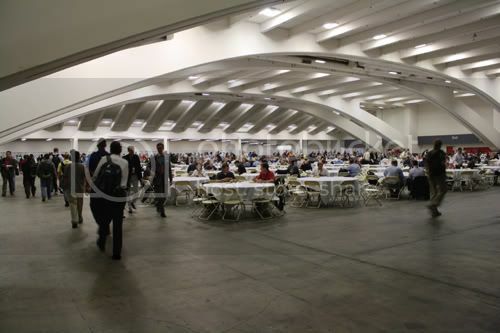 Exhibit B: the “feed lot” for meals, in a space remeniscent of an airplane hangar. And yes, there is a difference, at least according to Asigra executive vice president Eran Farajun—portability of data. “Online backup is the closest thing to the cloud, but it still has one foot in the distributed-computing era,” he said. If users want to switch service providers, they pretty much have to orphan data or receive it back in raw format that can be labor-intensive to reassimilate behind the firewall. Asigra had been focused on service providers for years before the cloud computing buzzword became hot, and Farajun said that because Asigra is already set up for multi-tenancy and virtualizes the media server on the service-provider end (the customer has a backup “master” server that collects new data on-site), customer workloads can be shifted directly from one partner to another. It’s an interesting and helpful distinction to make, the kind of thing we need more discussion about as the cloud phenomenon gains steam. 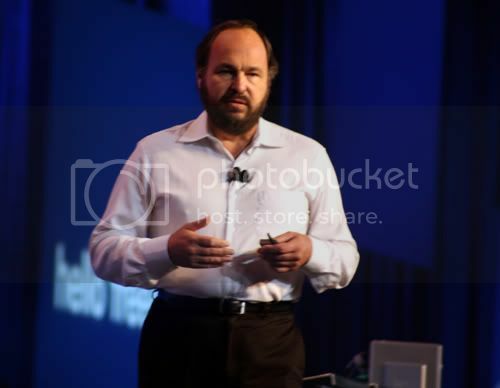 VMware CEO Paul Maritz gives a keynote speech on Monday morning. Seanodes CEO Frank Gana says the iSCSI SAN vendor is in the midst of deployment with European customers on IBM’s BladeCenter servers. Keep an eye on this pairing – IBM has some iSCSI offerings, but nothing to directly compete with HP/LeftHand running on HP BladeSystem, which HP began offering this week as a VDI reference architecture. 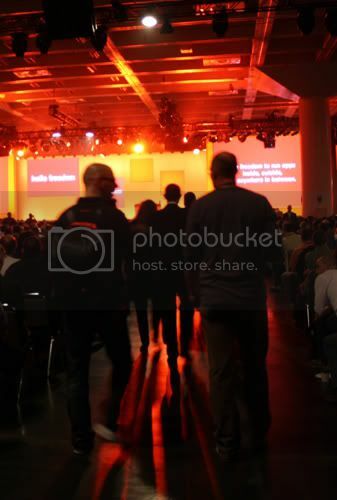 Xsigo usurps Cisco in VMworld show floor demos? An interesting new addition to demo hardware this year was “What’s under my hood?” signs next to the roaring machines in show floor booths. 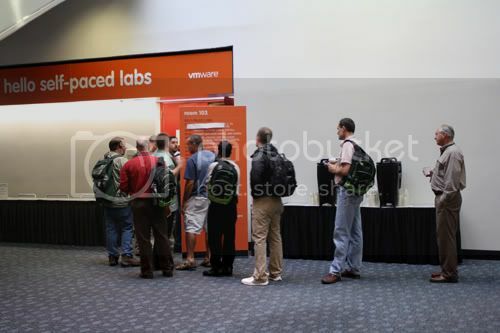 The one at VMware’s booth consisted of EMC storage, MDS servers, and…Xsigo I/O virtualization interconnects, rather than the more-hyped VCE approach. Cisco was hardly inconspicous, though. 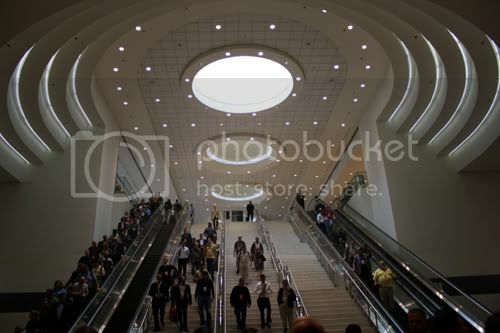 Massive UCS racks greeted attendees as soon as they came down the Moscone Center escalators to get to breakout and general sessions (photo below). 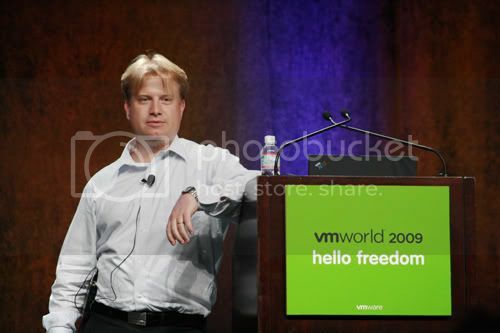 Building off their 50% storage reduction guarantee for VMware environment (see full story, including fine print), NetApp was offering customers $1 million worth of storage equipment in exchange for a chance to prove they can achieve the 50% reduction. NetApp Chief Marketing Officer Jay Kidd said in this case, the customer agrees to be a public reference for NetApp if the deal works out. 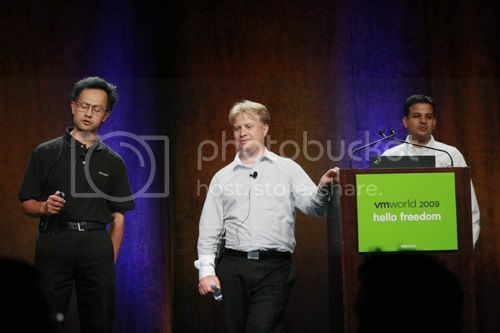 VMware senior staff engineer Shudong Zhou, EMC VP of VMware technology alliance Chad Sakac, and Cisco manager of product marketing Balaji Sivasubramanian fill attendees in on the finer points of VMotion support. Just part of the VCE distance VMotion test bed config. A must-see T-shirt was a big hit at the show: newScale’s WILL PROVISION FOR FOOD. The full story behind it was blogged here. More pics available on Flickr.